Summary of Case: Thomas Feldhaus was ordained a priest of the Archdiocese of Cincinnati in 1976. He assisted at parishes in the communities of Mt. Airy and Delhi Hills before beginning an eleven-year pastorship in Ripley in 1990, followed by a pastorship in Cincinnati in 2001. Feldhaus also spent several years in the late 1970s-early 1980s in Rome for graduate studies, and was a hospital chaplain for several years in the late 1980s-early 1990s. In November 2003 a man reported to the archdiocese that Feldhaus had "inappropriately touched" his young son in 1979 while assigned to St. Therese, The Little Flower in Mt. Airy; Feldhaus was placed on administrative leave. In a lawsuit filed in March 2004 another man accused Feldhaus of having sexually abused him as a boy. This accuser, a former student of Our Lady of Victory in Delhi Hills, said the abuse occurred 1986-1991. Feldhaus remained on administrative leave until October 2014, when his laicization was announced by the Vatican. Archbishop was Joseph Louis Bernardin (1972-1982). • Feldhaus was accused in November 2003 of having "inappropriately touched" a boy in 1979 while assigned to St. Therese. St. Therese's had a school with 545-525 students. Bernardin was succeeded as Cincinnati archbishop by Daniel Edward Pilarczyk (1982-2009). • In a March 2004 lawsuit, Feldhaus was accused of sexually abusing a boy from 1986-1991. His accuser was an Our Lady of Victory student. OH 2/3, 2/2 Our Lady of Victory had a school with 742-587 students. 1987 1988 St. Therese, The Little Flower Cincinnati (Mt. Airy) OH 2/2 St. Therese's had a school with 412 students. 1988 1990 Good Samaritan Hospital Cincinnati OH chaplain Feldhaus is not indexed in the 1989 or 1990 Directories, nor is he listed in the Cincinnati pages as at his previous or next assignments. This assignment is per news reports. 1990 2001 St. Michael's Ripley OH 1/1 St. Michael's had a school with 91-44 students, and a religious education program with 30-139 students. St. John Neumann's had a religious education program with 281 students. 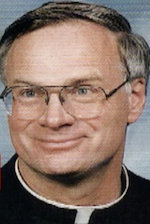 Feldhaus was placed on administrative leave in November 2003 after the archdiocese received a complaint that the priest "inappropriately touched" a boy in 1979. 2003 2007 Feldhaus is not indexed in the 2004-2007 Directories, nor is he listed in the Cincinnati pages as at his previous or next assignments. Dennis Marion Schnurr replaced Pilarczyk as Cincinnati archbishop (2009-). Feldhaus is not indexed beyond the 2014 Directory. Feldhaus was laicized by the Vatican October 28, 2014. Sources: Official Catholic Directory (Kenedy & Sons, 1977-2015). This assignment record collates Feldhaus' career history as it is represented in the Official Catholic Directory with the allegations against him, as reported in the media. We make no representation regarding the truth of the allegations we report, and we remind our readers that the U.S. legal system presumes that a person accused of or charged with a crime is innocent until proven guilty. Similarly, individuals who may be defendants in civil actions are presumed not to be liable for such claims unless a plaintiff proves otherwise. Admissions of guilt or liability are not typically a part of civil or private settlements. For more information, see our posting policy. This assignment record was last updated on November 4, 2016.